Live performances of Seiber’s music are strangely rare today. Admittedly they were never especially frequent but it was at least possible during his lifetime to form an idea of the scope and nature of his work from a mixture of live performances and broadcasts. A quick glance at the invaluable BBC Radio Times website shows that in Britain at least it was possible from the 1940s to the 1970s to hear a reasonable cross-section of it. Later this was reduced to a mere trickle, largely repeating the same few works. 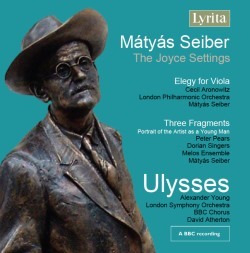 I remember vividly a memorial concert in the Maida Vale studios in 1961 which included Ulysses but even that superb work has virtually disappeared in recent years. All the more reason then to give a very strong welcome to this disc. In this I wholly endorse the enthusiastic earlier review by John France. Like him, would draw attention to the lengthy and helpful essay by Alan Gibbs on this site. I can add nothing to their exposition of the composer’s career or of the background to the two main works on this disc. That leaves me solely to encourage those who do not know these works or this composer to investigate this disc. Ulysses is not only the longest but the most approachable of the former. It has a wonderful way of instantly drawing listeners in to the musical argument and holding them there through its changing but always logical character. Hugh Wood’s booklet notes suggest that it might be regarded as a choral symphony as much as a cantata, and so indeed it might. It is perhaps surprising that a composer who lived in Hungary and Germany until 1935 when he came to England should have been able to choose and set with such perception extracts from novels whose use of language is so complex. It was perhaps related to his ability to make use of musical influences from such a wide range, turning them into something that is wholly his own. Both vocal works here are strongly characterised and wholly absorbing. Siber became well known for his ability to write apt dramatic incidental music and generate atmosphere quickly. These qualities are very evident in both the main works here. It is simply extraordinary that they have been so neglected in recent years. This is a disc that should reawaken interest in a great but sadly short-lived composer, with excellent performances, recorded some years ago but with no need to apologise for the sound. It is well presented with good notes and the full texts. This must surely be one of the most important discs of neglected music issued by Lyrita. That's saying a great deal.